Stonewall research refers to a group of "hesitant allies" who want to make sport more inclusive but lack the confidence. More than half of supporters want to tackle anti-LGBT language at sporting events, but only a quarter have the confidence to do so. Charity Stonewall published the research to coincide with this year's Rainbow Laces campaign, where professional and amateur players from a range of sports will show their support for the LGBT community. The survey of more than 1,000 adults concluded there was a group of "hesitant allies" who want to make sport more inclusive but lack the confidence or understanding of how to achieve this. Some 58 per cent believe it is important to challenge anti-LGBT language and 53 per cent agreed everyone has a responsibility to call it out, but only 25 per cent said they would feel able to intervene. "Sport is one of our strongest tools for social change," said Stonewall director of sport Kirsty Clarke. "Which is why it's so powerful to see so many people wanting to do more to support LGBT people and challenge anti-LGBT abuse in sport. "Over the past few years, we've seen inspiring work from many sporting associations who are committed to creating an inclusive and welcoming atmosphere. "We want more players, fans, clubs and organisations to join in and understand how they can play a part in changing attitudes and standing up for LGBT equality. "Our work won't be finished until every lesbian, gay, bi and trans person, from fans to players, is accepted without exception." 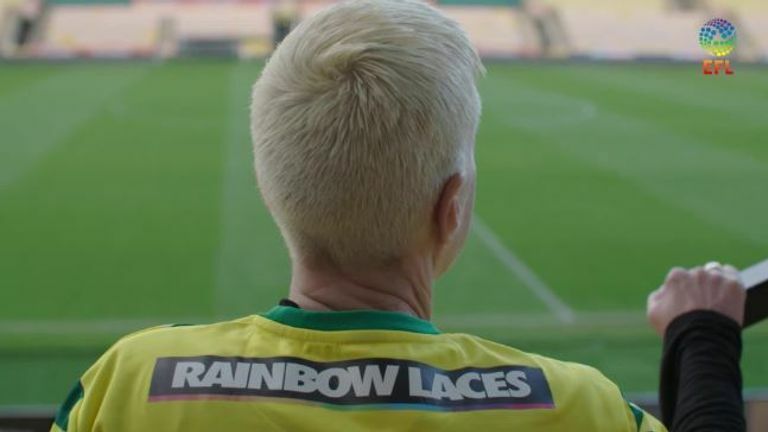 All 72 EFL clubs across England and Wales are being invited to back Stonewall's Rainbow Laces campaign in the week leading up to December 1. Last weekend, many clubs used their home fixtures to highlight their continued support for LGBT fans, players and staff, with rainbow captains' armbands, laces, and programme adverts also being used. Stonewall's research comes a day after Kick It Out, the equality and inclusion organisation, reported a sixth straight annual increase in reports of discriminatory language in English football. According to Kick It Out, reports of homophobic or transphobic abuse in football have risen 9% from 102 cases in 2016-17 to 111 in 2017-18.